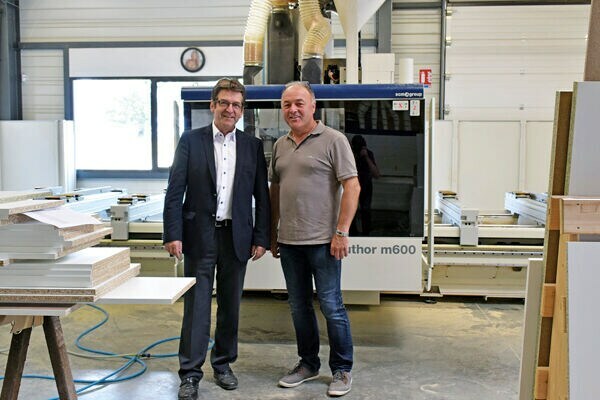 Located in Franche-Comté at Etalans in the Doubs region, Menuiserie Simon is specialised in made-to-measure panel and furniture manufacture. The family business was founded in 1995 by two brothers, Christophe and Jean-Luc Simon. Initially its core business was traditional carpentry, but then it gradually began to focus on store furniture and fittings. On one hand, it works for chemists and shops, and on the other as a subcontractor for local industries and carpenters. The company shows how crafting made-to-measure items in a local partnership can be a successful business, and one example, are the 600 specially made items for hiding Resix joints it supplied to the Simonin company for the French pavilion at the 2015 Universal Exposition in Milan. Most of its business, however, involves making, assembling and delivering store furniture and fittings. A dozen people work for the company, five assemble the furniture while four more operate in the workshop. The projects are managed internally using Top Solid and Xilog Maestro, the software designed by the SCM group to structure tasks so they suit its machines perfectly. The design process, on the other hand, is outsourced to local design offices. 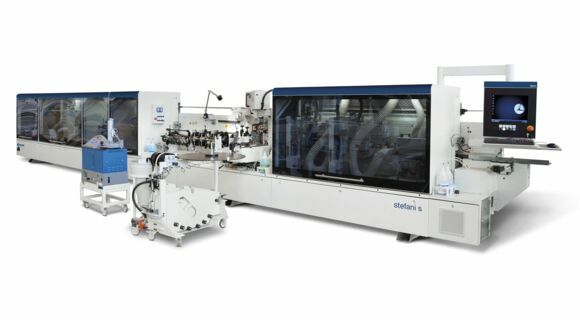 Menuiserie Simon is therefore a highly efficient workshop organised around effective, up-to-date machines. 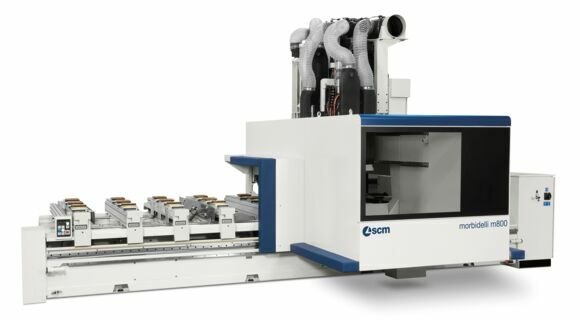 To meet demands more effectively, the company’s woodworking section boasts a well-equipped workshop including an SCM gabbiani gt3 panel saw with a loading platform for panel cutting. A morbidelli m600 5-axis work centre is responsible for all the drilling and grooving and ends are trimmed using a stefani s (Solution before rebranding) edge bander fitted with a Slim Line aggregate. This very special system spreads the glue on the trim and not the panel using powdered PUR glue. Developed by Nordson, it ensures that the joint is slimmer, the glue seals are perfect and the trim is completely watertight. This guarantees a top-quality finish and there is no risk of the panel getting damp and swelling as this causes irreversible damage. The adhesive is fed into the machine by heating only the surface of a bar of glue, which means that start up is very quick. Glue dosage is also extremely precise and completely smear-free. The whole system can also be cleaned in just a few minutes with a special cloth. The aggregate used is more expensive than a standard aggregate, but the advantages in terms of quality and consumption easily offset the difference in price. 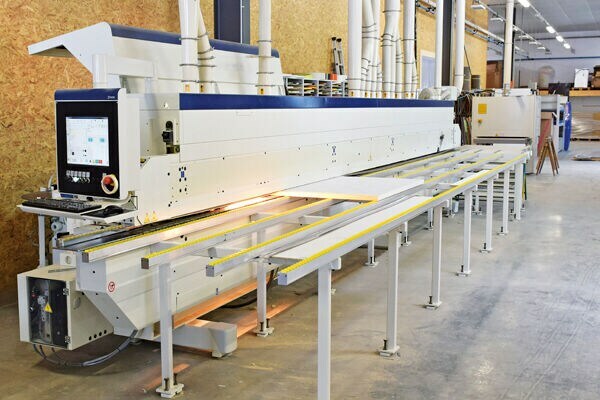 The Slim Line system can also operate with any kind of trim type, width or thickness. There is no doubt, then, that regular investment and cost management are at the heart of Menuiserie Simon’s company’s growth. This is what the company focuses on: being able to provide an excellent quality/price ratio and optimise work times. A company doesn’t necessarily have to be less expensive, but it does need to know its tools, assess workloads correctly and know how to set consistent prices and earn a normal living. “The days in which performance was enough are over. Now you need a more competitive price, for both customer and supplier, without ever sacrificing quality standards!”, Christophe adds. Word of mouth, especially in the pharmacy sector, does the rest. That is how the Menuiserie Simon enters new markets, like that of wardrobe doors, for example, that it is currently enjoying considerable success with. “Pictures of our premises and machinery are extremely important for enhancing our image with customers,” concludes Christophe. The company therefore has everything it needs to take advantage of the increased demand it has winessed since the beginning of the year.